Type of wine: Crisp, dry, light-bodied white. 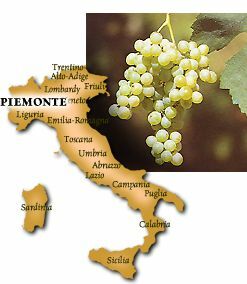 Origin: Hills of southeastern Piemonte, where it is better known as CORTESE DI GAVI or simply GAVI. Description: A pale yellow color and lemon and flint aromas are indicators of the crisp, dry flavors which follow. Light in body, Cortese is bracingly refreshing, with a long finish. Aging: Don't do it! Cortese should be drunk young and racy. Best location: Warm days, cool nights. FastFoodFacts: The quintessential seafood wine: raw oysters, steamed crab or lobster, shrimp scampi. Try with sushi or Vietnamese cuisine, as well. Likes garlic.